"That's the problem. We let people say stuff, and they say it so much that it becomes okay to them and normal for us." Starr Carter is a 16-year-old girl living in two worlds: the poor black neighborhood where she lives and the fancy suburban prep school she attends. She has a childhood best friend, Khalil, and a different best friend at school. It takes skill to balance both worlds. But they collide when Starr witnesses the fatal shooting of an unarmed Khalil at the hands of a police officer. It soon becomes a national headline. Some people around school are calling Khalil a thug. Some even suggest he had it coming because he was a gangbanger. But Starr knows the truth. And when it becomes clear that the police choose to not investigate, protesters turn the neighborhood into a war zone. Starr has to determine whether to stay out of it or possibly endanger her life by telling what really happened that night. "There's Them and then there's Us." I could totally relate to Starr in how she essentially had to live a double life. I didn't grow up in a poor black neighborhood but did not attend the same school as other kids on my block did. I traveled across town to attend a school for the "talented and gifted." A school that was mixed race, college-prep and for the elite students of Detroit. While everyone else shared stories of what happened in school on a particular day, I was too busy doing homework and hanging out with my "smart friends." I was so far removed from the goings-on at the neighborhood school but was still respected and recognized as a girl from the East side. Either the author, Angie Thomas, had a similar situation growing up in Mississippi or she knew someone because it was perfectly depicted in this unflinching honest debut novel. When a book is really good, it takes me quite a while to post a review. Why? Because I want to be sure the story sticks with me long enough to warrant a 5-heart rating. I wait even longer for popular books to see if the hype is right. Upon immediately finishing The Hate U Give, I knew it was excellent. A story that could happen in real life yet well written in fictional form. It is gripping and powerful from beginning to end. A debut novel deserving of awards and film rights. Angie Thomas, high five! 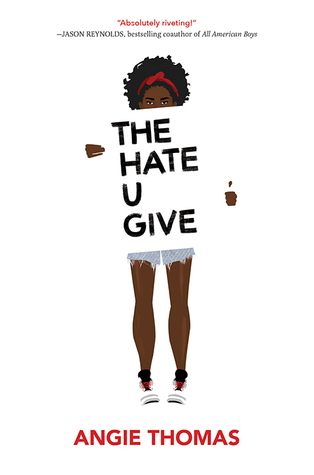 I recommend The Hate U Give for young adults and grown folks. It is age appropriate for the high-school student in your life and should be recommended reading in English or Social Studies classes. It addresses issues of racism, the community, violence, stereotypes and the story behind popular hashtags. The Hate U Give will force readers to see things from another point of view and make you go hmmm. At the minimum, it will be a conversation starter because of the bold cover. Look at it; how could you not pick this up and read?